On a sunny July day in Ft. Worth, Texas, a simple question was asked. 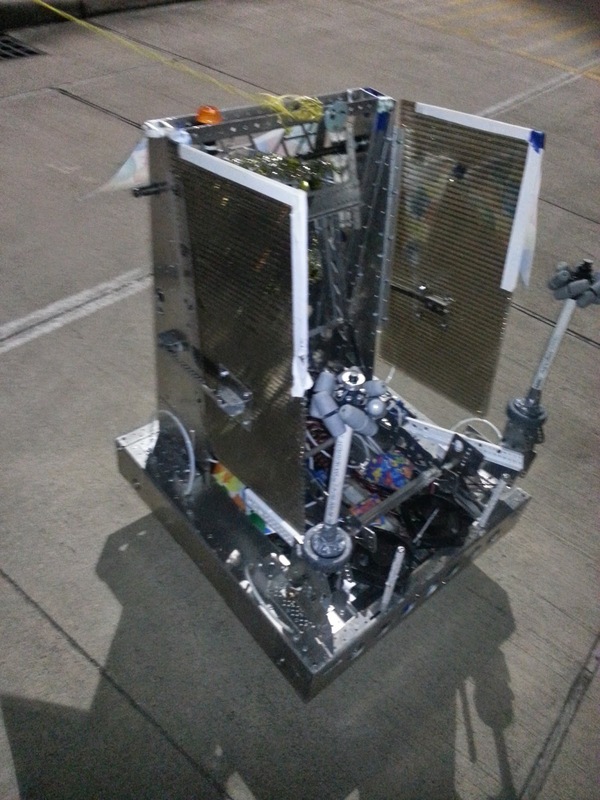 If you are given a different team number when you run two robots at an off-season event, why not just create a second team? Of course, these things are easier said than done. After all, some teams take years to build a brand, but this team was to compete in less than 12 hours. How could a brand be built in so little time with so few resources? The team pondered this seemingly impossible problem. For awhile it seemed all hope was lost, but then the team had a brilliant idea. "TO THE DOLLAR TREE!" they cried. And so after the pits were closed and dinner was consumed the team trekked to the nearby Dollar Tree with but a few hours to form a workable theme. The team spread out and scrutinized each and every aisle. Several options presented themselves. A beach theme or an American theme seemed quite doable, and the abundance of school supplies and cleaning supplies sparked many creative ideas. However once the team intensely discussed these and many other options, one idea indisputably stood high above all others. It was at this very moment that this team's simple question gave birth to a new phenomenon: BIRTHDAYBOTS. The brilliance behind this idea was clear: Everyone loves alliteration and the Dollar Tree is full of birthday supplies. After this revelation was had, BirthdayBots purchased a plethora of celebration gear including party blowers, birthday hats, tablecloths, hanging signs, birthday balloons, centerpieces, and more. In total they spent just under $15. Then BirthdayBots triumphantly proceeded back to their hotel, where they solidified their new team's philosophy. They composed a creed which defined BirthdayBots' values and mission. BirthdayBots believe that everyone should be treated like it's their birthday, every day. They strive to celebrate everyone and wish the best to all with whom they interact by greeting everyone with an enthusiastic "Happy Birthday". When they are introduced at the start of matches they blow the birthday party blowers to signal the start of the party. 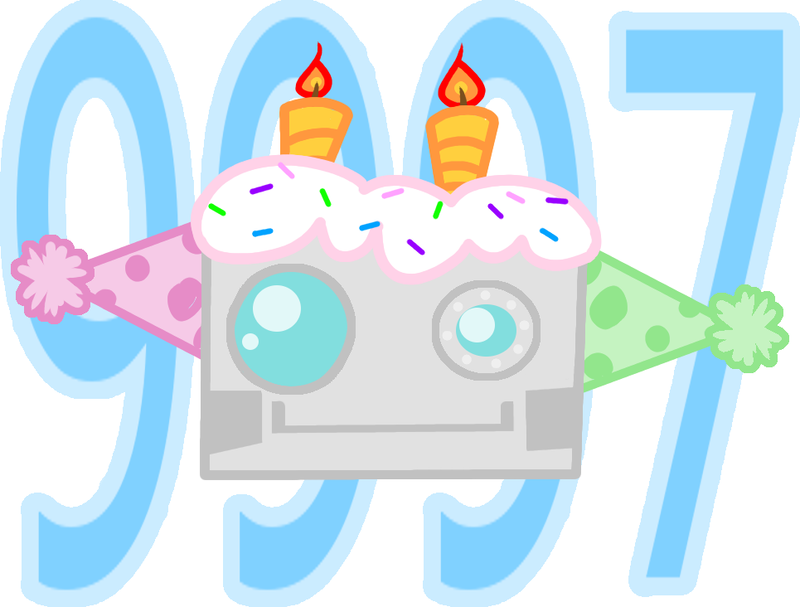 Also one artistically-talented student quickly designed a fun but professional-looking logo for for FRC#9997 BirthdayBots. 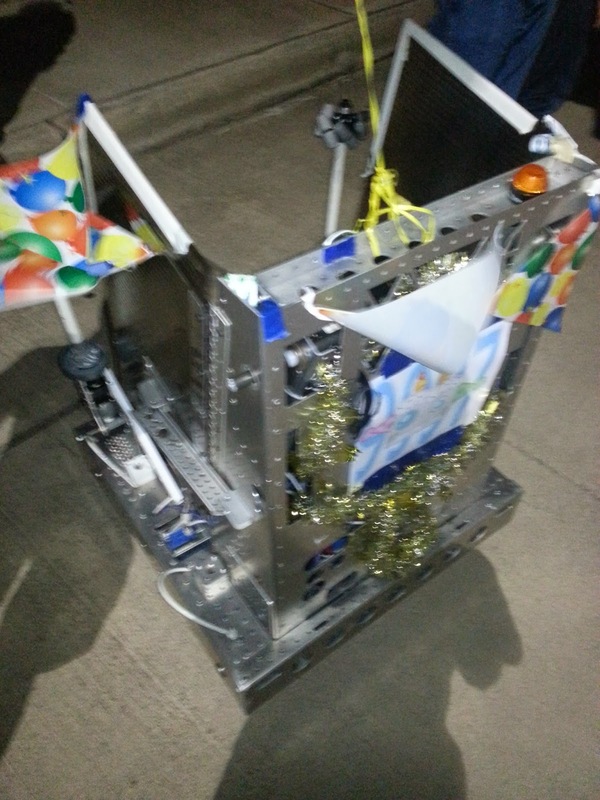 The next day, BirthdayBots festooned their trusty robot Sprinkles(s) (they never decided whether or not the name was plural) with tinsel and pennants so it would be as birthday themed as possible. Sprinkle(s) is a pneumatics-free version of Spectrum's practice robot, meaning that Sprinkle(s) is unable to launch balls or pick them up from the floor. It is, however, able to human load, kiss pass, and pass back. Sprinkle(s) played its preliminary matches with much spirit and bravery. Unfortunately, Sprinkle(s) was unable to compete in the final matches due to a shortage of teams. Sprinkle(s), regrettably, will be missed. The rest of the matches can be found on the YouTube playlist for RoboReboot. Match Listing and Results are all on The Blue Alliance.